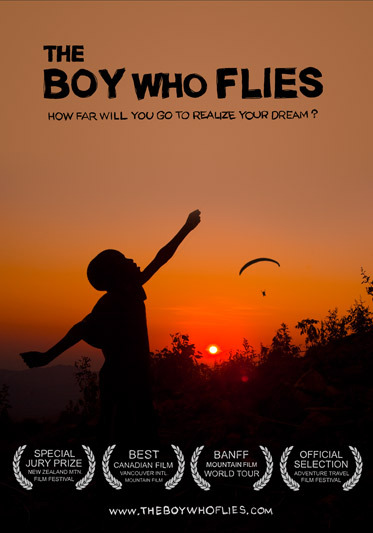 PROJECT: The Boy Who Flies (2011/12/13) more project profiles coming soon.. 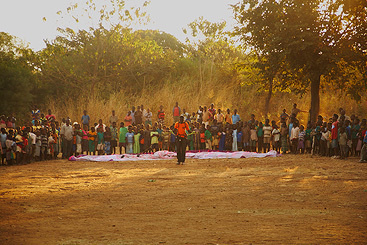 Photographer and paraglider pilot, Benjamin Jordan travels to Malawi to teach children the joys of kite flying. 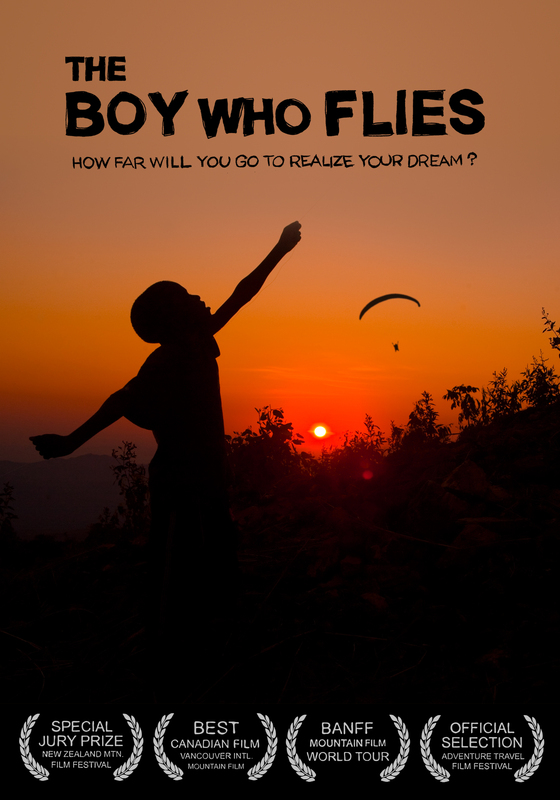 There, he meets Godfrey Masauli, a young Malawian man who has always dreamt of flying though has never had the means. 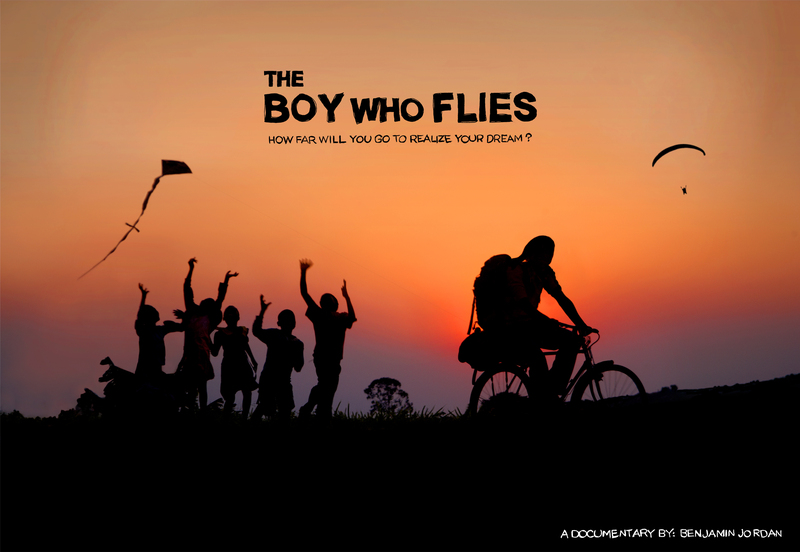 The odd pair borrow a couple bicycles, ride around the country and build kites with youth while motivating them to follow their dreams no matter the challenge. They are destined for Mount Mulanje, Africa's second highest peak, where after weeks of ground training the two will attempt to paraglide down making Godfrey the first Malawian paraglider pilot. Observing himself through the eyes of the Malawians, Jordan must come to grips with truths about who he is as a westerner while Godfrey is required to reach deeper into his faith than ever before to believe that the crazy white man knows what he's talking about. What began as a seemingly ridiculous dream, and a sorry excuse to avoid the 'greater' responsibilities in ones life, has beautifully woven itself into this award-winning gem, breathing vivid new life into the society. 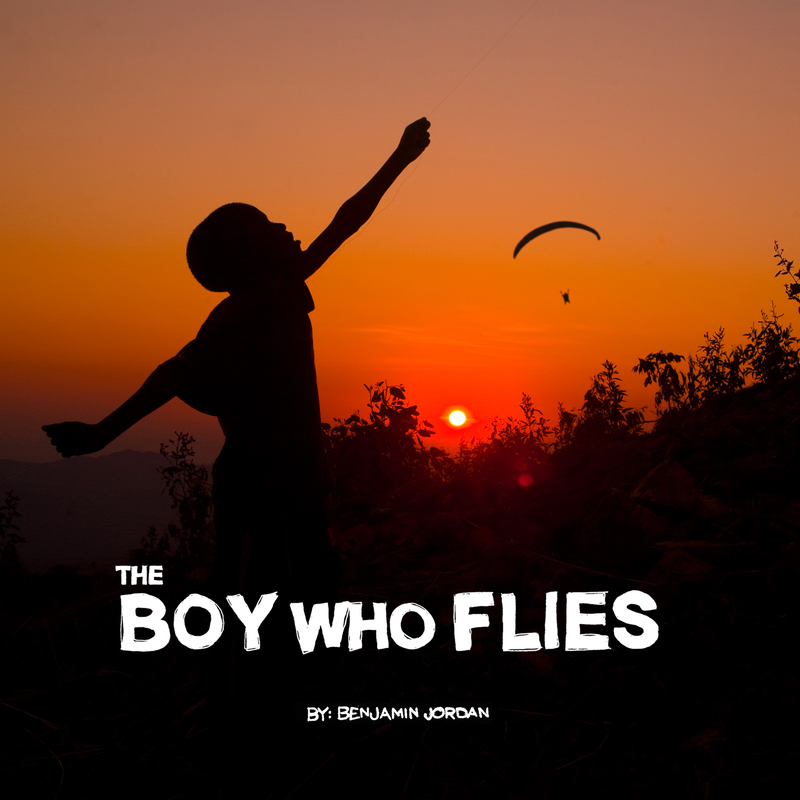 Two weeks after Canadian documentary-maker, Benjamin Jordan awoke with a vision of teaching a young African man to paraglide, he hopped on a plane to Malawi, carrying only a small point-and-shoot camera. His intention was to produce a short teaser reel to attract funding for a high budget documentary he would shoot with a team the following year. All he needed was to find the right location, and people, to work with. Instead, all of those things found him. Faced with an inconceivably perfect friendship with a young man who was eager to take to the skies, Jordan took his tiny camera, loosely knit ideas and recorded every last moment of their incredible voyage. 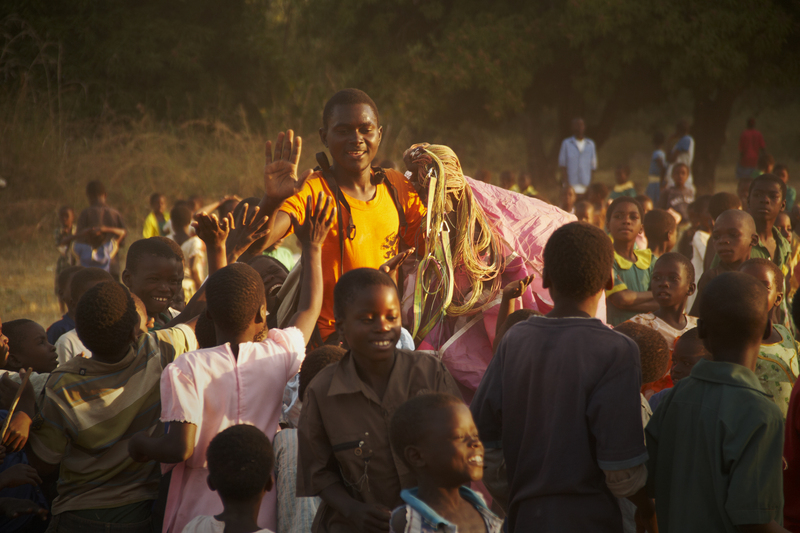 From cycling across Malawi, to heated arguments about gay marriage, to the young Malawian's incredibly emotional first flight, the little camera caught it all. 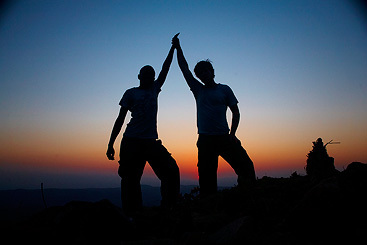 Upon returning to Canada he was drawn to tell this magical story exactly as it had unfolded, but realized that, the more he reviewed these incredible events, the more he was able to view his own character objectively, entirely transforming his own experience and telling the story through that transformation. While this self-funded film was shot on a shoe-string budget, the editing process and festival submissions could not have occurred without the 450 micro sponsors from around the globe who shared our inspiration and contributed to this amazing project. 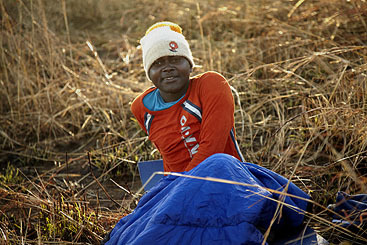 "A young man risks everything to become Malawi's first paraglider pilot." Following a dream, Canadian paraglider pilot Benjamin Jordan travels to Malawi to teach children the joys of kite flying. There he meets Godfrey, a young man who has always dreamed of flying though has never had the means. 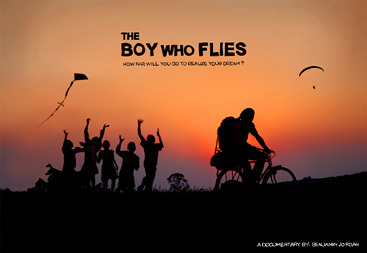 The odd pair tour the country on bikes, building kites with youth while motivating them to follow their dreams. 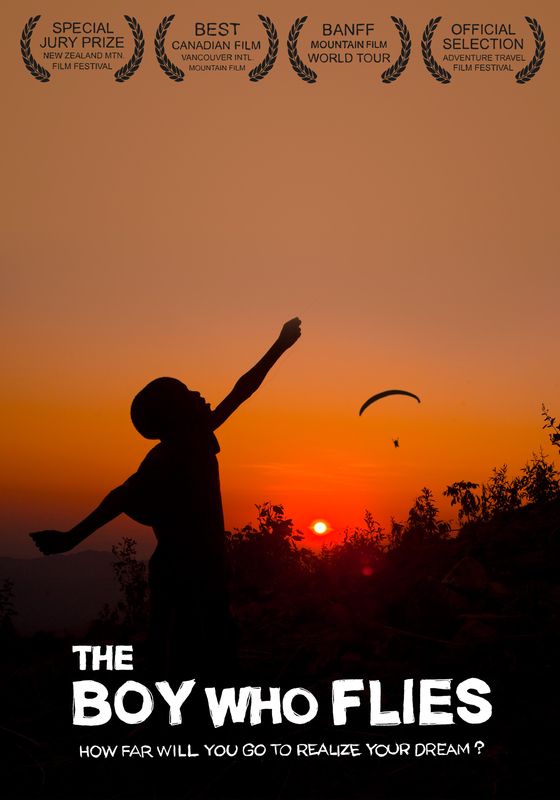 They are destined for Malawi's highest peak where, after weeks of ground training, the two will attempt to fly down and make Godfrey the first Malawian paraglider pilot. 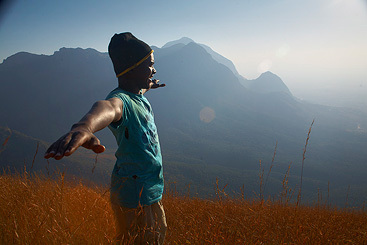 Observing himself through the eyes of the Malawians, Jordan must come to grips with truths about his own racial and cultural identity while Godfrey is required to reach deeper into his faith than ever before as he prepares to leap off a mountain, trusting that the paraglider he's been carrying will carry him in return. Faced with an inconceivably perfect friendship with a young man who was eager to take to the skies, Jordan took his tiny camera, loosely knit ideas and recorded every last moment of their incredible voyage. 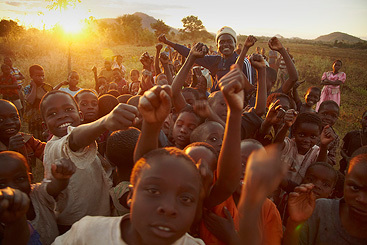 From cycling across Malawi, to heated arguments about gay marriage, to the young Malawian's incredibly emotional first flight, the little camera caught it all. 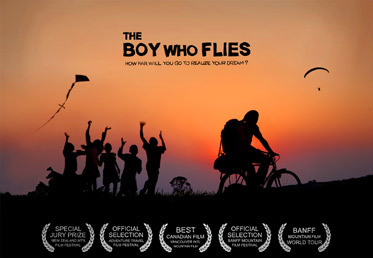 Upon returning to Canada he was drawn to tell this magical story exactly as it had unfolded, piece by piece, turning all of his 'research material' into an award winning documentary. Click here to read an online copy of this article. Director, Benjamin Jordan lives in the Rocky Mountains of Western Canada. Having grown up in Toronto, he entered the art world as a fashion and advertising photographer and later turned to documentary making in search of work that felt authentic. 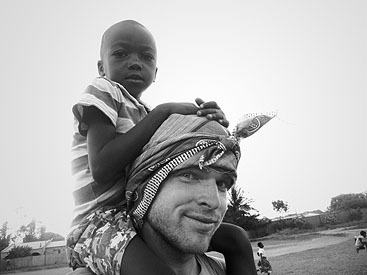 He has since produced and documented incredible stories like Push For The Cure, his 8000 km skateboard trek across Canada, raising upwards of $1-million for Breast Cancer and Above + Beyond Canada, a 10,000 km, World Record Breaking powered paraglider journey, by which he made the return voyage across his homeland only two years later. Recently, Jordan has returned from Malawi and produced "The Boy Who Flies", documenting the inspiring story of Godfrey Masauli; a young man who had always dreamed of flying, though hadn't the means. Through a mosaic of philosophy and personal transformation, Jordan is forced to look past his own ego to discover a common path on which people can unite through the power of dreams. Co-producer, Godfrey Masauli llives in a small village just outslide of Blantyre, Malawi. 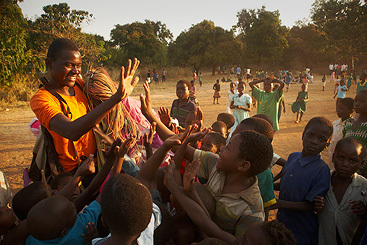 His uncle, and greatest role model, was one of the first black men flying airplanes in Malawi. From a very young age, Godfrey had intentions to follow in his uncle's footsteps and become a great pilot himself. Things changed in the 90's when the country's currency suffered inflation so significant that the increased cost of fuel and spare parts was enough to cause his uncle to shut down his business and sadly, never sat foot in an aircraft again. 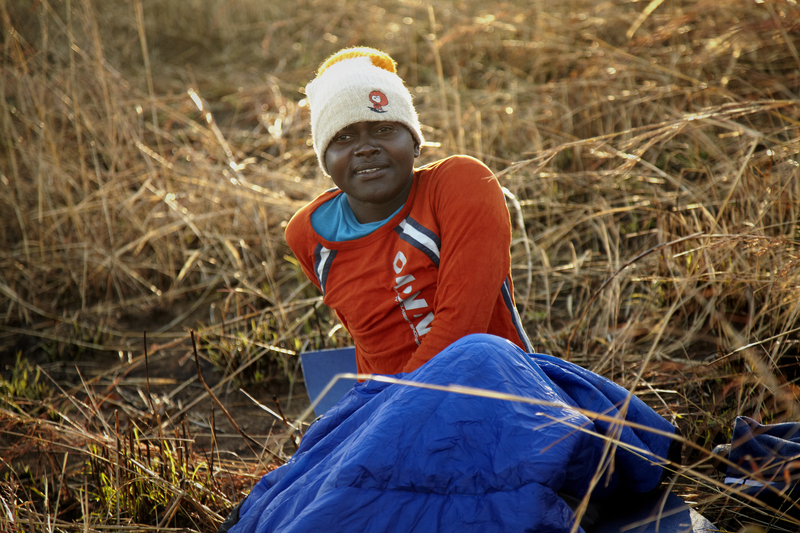 Shattered and without direction, Godfrey let go of his dream and, once out of school, found himself working construction and selling charcoal on the side. 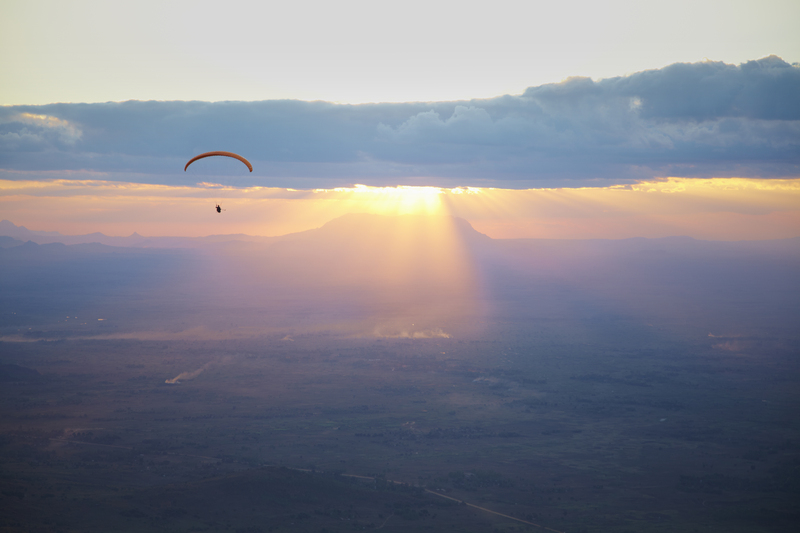 Recently, luck fell upon him and he met Canadian, Benjamin Jordan, who, through means of producing a documentary, ultimately taught him to paraglide. Since becoming the first Malawian Paraglider Pilot, Godfrey has become an influential figure in his surrounding communities and Malawi at large. Bringing his newfound inspiration to local classrooms and public venues, Godfrey's empowering presentations have grown to bigger venues, including National Universities, TED Talks and most recently a three month tour of the Untied States. Click an image to load the hi-res version. This is a small selection of film stills to get you going. If you would like to access the entire archive, email Benjamin. When using, please credit "Benjamin Jordan / TheBoyWhoFlies.com"
Bring this magical journey and insightful film to your community by organizing a screening event, big or small. Aside from film festivals, community screenings are the only way an independent film like The Boy Who Flies is able to reach the scale of audience it deserves. Best of all, these events provide a platform for critical thought and engaging discussion around the ideas and inspiration presented in the film. Download high resolution photos and posters from our, press kit. Design your own poster with these tools layed out just for you. If your event is free for patrons, there is no fee to screen the film. If you are charging for tickets, requesting donations or using the event as a fundraiser we ask that you share your proceeds with us half and half. If this doesn't work for whatever reason, we're happy to talk about it. 50% Funding the ongoing distribution and outreach of this film. 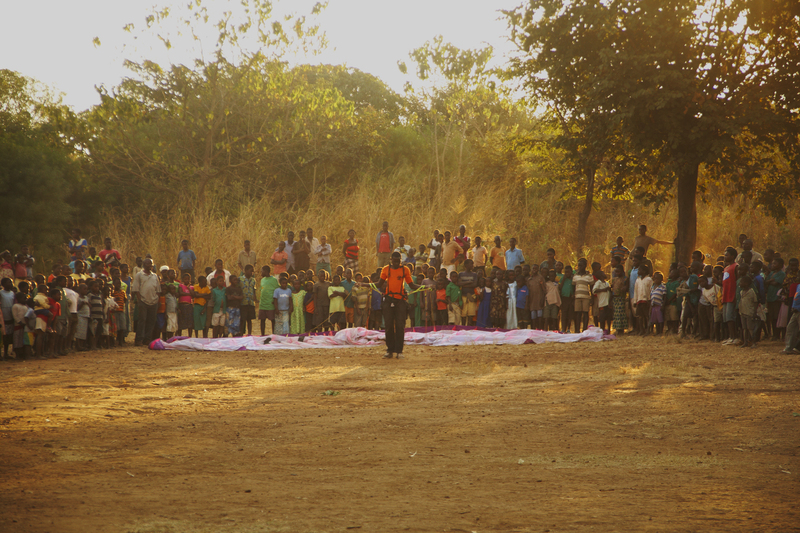 50% Directly towards The School of Dreams, Malawi's first Paragliding School. The above guide lines are for community screening hosts. 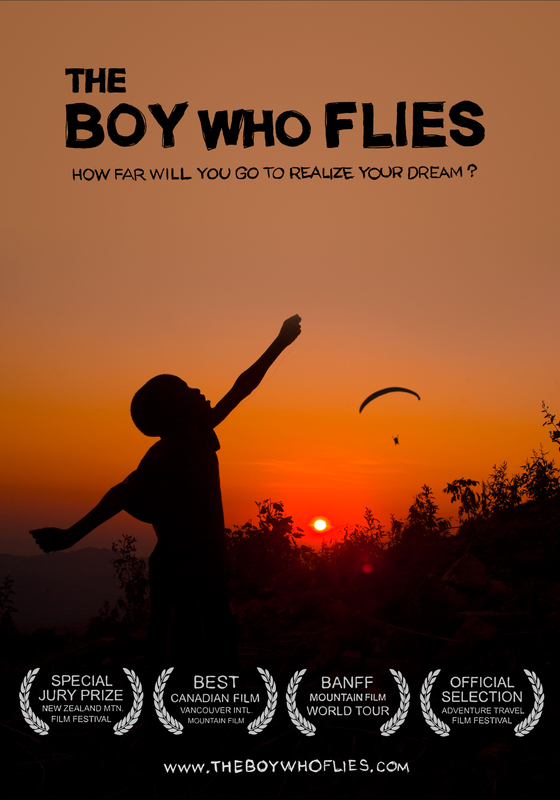 Festivals and organizations, please email us at screenings@theboywhoflies.com. We are happy to work with your standard arrangements. The Above and Beyond Documentary Society holds the rights to distribute this film on every platform, in every territory and is cooperating with distributors Europe and North America to handle contracts when necessary. To access a screening copy or to check rights availability in your territories, please begin by emailing us and someone here will be pleased to get you everything you need. The society measures it's success by the degree to which it has used it's creative works to benefit the communities and individuals it documents. That said, The Boy Who Flies stands proud as one of our greatest victories to date. 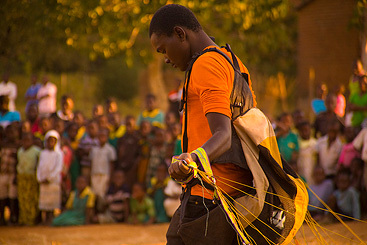 Since becoming the first Malawian Paraglider Pilot, Godfrey has become an influential figure in his surrounding communities and Malawi at large. So far, the film has raised over USD $25,000, in equipment and capital, for the School of Dreams initiative ..more than double the film's budget. And has now undergone months of professional paraglider training by certified instructors in the USA. 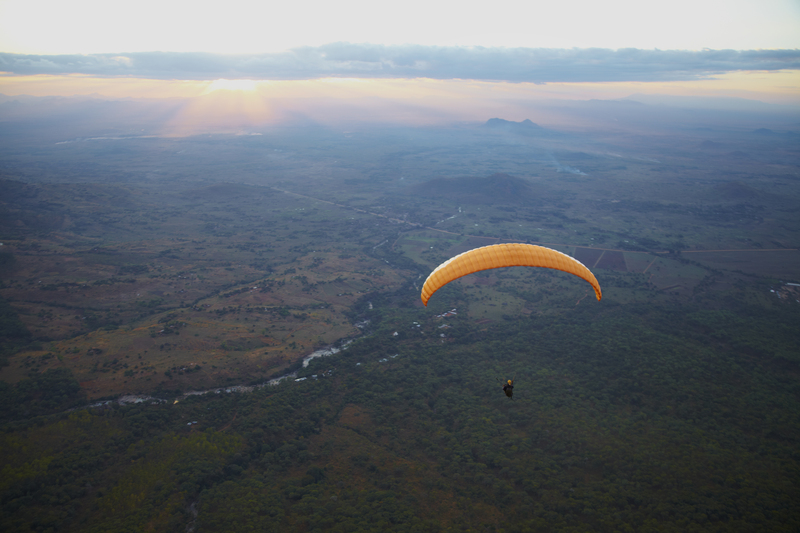 As Malawi's only paraglider pilot, is able to offer guiding services to visiting pilots. Has become an exciting travel destination for hundreds of thousands of filmgoers around the world. The School of Dreams Malawi, platform for ongoing Paraglider training and personal development, has now established roots. A great new online guide for Paragliding and Cultural Travel in Malawi will go live Feb 1, 2015.